Lucy McEvoy has been selected for England Hockey's HiPac 2016 for girls U17. HiPAC is a two day high performance assessment camp run for some of the best player in our U15 and U17 age groups. National age group selectors attend the camp and sect of U16 and U18 England squads. The U17s camp will take place at Lilleshall National Sports Centre, Telford from Sunday 23 October to Tuesday 25 October 2016. Dave Bryce - HiPAC Coach! 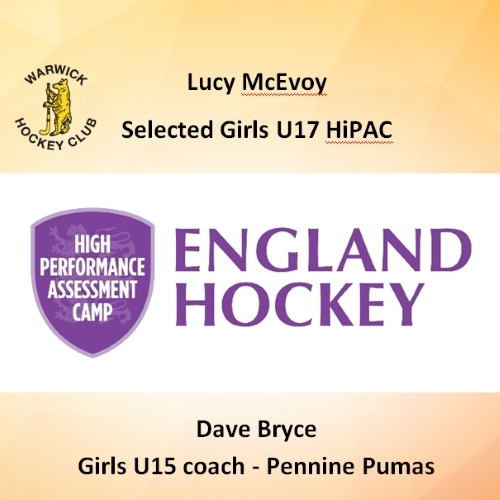 Congratulations also to Dave Bryce who has been selected to coach the Girls U15s HiPAC group 'Pennine Pumas'. This is a great opportunity for Dave to further develop his coach experience and clearly recognizes the great work he has done to date.